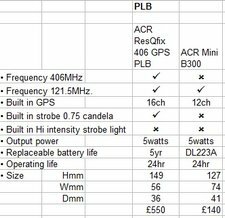 Last year I did a quick summary of the EPIRB products then available because I had come to replace my old 121Mhz EPIRB. unique identification of each beacon. System performance is greatly enhanced both by the improved frequency stability of the 406 MHz units and by operation at a dedicated frequency. These beacons transmit a 5 Watt RF burst of approximately 0.5 seconds duration every 50 seconds. The carrier frequency is very stable and is phase-modulated with a digital message. Frequency stability ensures accurate location, while the high peak power increases the probability of detection. For a treatise on the whole Search and Rescue topic you need go no further than good old Wikipedia of course, and it was here that I looked for explanations of what legal or international standards our EPIRB products should adhere to. They all seem to claim a variety of compliance certificates! The definitive list of standards can be found on the actual COSPAS-SARSAT web site here. Obviously you will want to get your EPIRB registered – something that most good dealers will do for you. 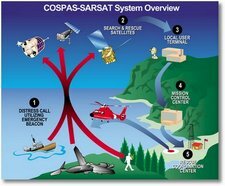 If you are in doubt then I recommend looking at the excellent COSPAS-SARSAT web site FAQ’s for information about your country’s registration process and the unique country code identifiers. You will also want to buy an EPIRB that has the correct approvals – not just a long list of acronyms that look impressive – again check out COSPAS-SARSAT – they provide a list of products by manufacturer here. A particular beacon model may be sold under several different names. All alternative beacon model names provided to the Cospas-Sarsat Secretariat by the beacon manufacturer are listed in the detailed report. 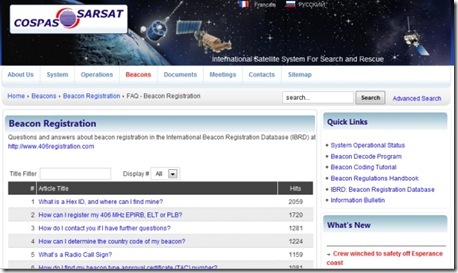 Detailed reports can be accessed via the table listing beacon models by Cospas-Sarsat type approval number. Some manufacturers use the same beacon model names for beacons with different type approval numbers. Cospas-Sarsat Numbers (No.) starting at 700 identify special use beacons. These beacon models are compatible with the Cospas-Sarsat System; however, they do not satisfy all Cospas-Sarsat technical and testing requirements as detailed in Cospas-Sarsat documents C/S T.001 (406 MHz beacon specification) and T.007 (406 MHz beacon type approval standard). Therefore, they have not received a Cospas-Sarsat Type Approval Certificate. In the maritime domain, EPIRBs are designated as either float free (FF) or a non-float free (Non FF). FF EPIRBs are designed to float away from a sinking vessel and activate automatically, whereas Non FF EPIRBs can only be activated manually. Thankfully the three I had shortlisted appeared to be correctly approved, including the excellent Australian GME products. 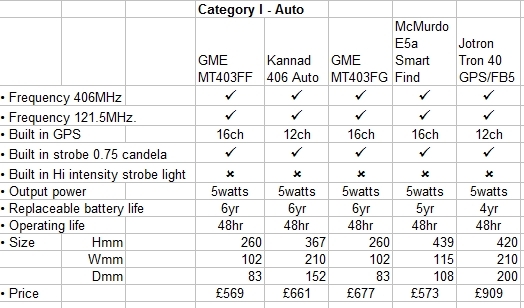 To download a PDF of my comparison chart click here…. Russ June 9th, 2010| No comments - be the first!|Tags: Electronics - EPIRB - Security. A bit late in the day I have been researching replacements for my Class B 121.5Mhz EPIRB which will be relegated to the grab bag and used as a PLB (Personal Locator Beacon) in an emergency. Cospas-Sarsat ceased satellite processing of 121.5/243 MHz beacons 1 February 2009. These beacons will only be able to be detected by ground-based receivers and aircraft for example actually engaged in a SAR operation that had been initiated using the new systems. A bit of internet research reminded me that the old analog system was accurate to around 20km (10.8nm) and that a SAR (search and rescue) operation would only be launched after two satellite passes – which could mean a delay of about 2 to 3 hours, often it would take 6 hrs to resolve the location by using multiple passes of the weather satellites system. The other factor to note is that the old 121.5Mhz system transmitted using about 75-100 milliwatts of power as opposed to the new beacons that are using 5 watts of power – a stronger transmission is a good thing in bad weather or storm conditions or when your location may be obstructed by things like cliffs! Is added GPS a useful feature? 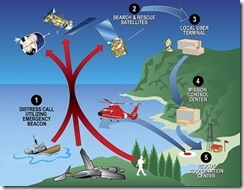 The main satellite system for picking the beacon’s signal is the SARSAT system, but in addition the geostationary GEOSAR satellites that cover more than 80% of the earths surface also pick up signals and can relay the GPS location data even though they cannot compute location themselves using the doplar effect. So how do you choose a 406Mhx beacon for your boat? The choice is then between Category I (auto deployment) and Category II (manual deployment) 406Mhz beacons…and also units with or without GPS. I have prepared a small table of units available in the UK market below. 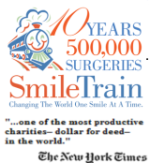 Click on the images for a larger view. Russ May 18th, 2009| One comment so far - be the next!|Tags: Electronics - EPIRB - Security. Code of Practice or Flag of Convenience? I have long lamented the poor service that boaters whether power or sail get when installing electronics on their vessels. Getting someone that understands a good installation, is honest enough to read the manual before starting, and doesn’t rip you off with unexpected “extras” is as rare as getting a good plumber or an honest politician. I have recently been looking at the The British Marine Electronics Association web site and noticed that they do more than represent the trade. The obviously are a trade organisations that represents installers and manufacturers of electrical and electronic equipment for marine use. 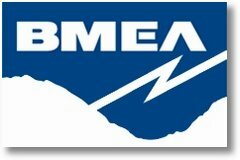 They also run an accreditation scheme called BMET. British Marine Electronics Technician accreditation is a new scheme that has been introduced to recognise the qualifications and experience of those involved with the installation of electronic and electrical equipment in boats.The scheme consists of intermediate and advanced level examinations and, verification of a candidate’s practical competence. Russ December 17th, 2008| One comment so far - be the next!|Tags: Electronics. Bilge pumps are like flares… you never need them until you REALLY need them, and when you do, you will wish you had 2 fitted! The recent test of bilge pumps carried out by Profs. at Southampton Solent University for Practical Boat Owner has a few gems in it. I didn’t realise for instance that the recommended discharge point is at the stern just like the engine exhaust. The discharge pipe has to be as short as possible because the energy required to overcome friction can exceed the energy required to lift the water!. Most of the pumps tested were 12v, manual switched, and under £50. The most impressive were the Attwood Tsunami and the Vetus EBP 80 . Both capable of lifting 40 litres (10 gals) of water 1 metre in 1 minute, and a good flow rate for power consumed. Due to lift height / friction loss in outlet hoses, bilge pumps are only running at (estimate) 80% of their stated capacity. 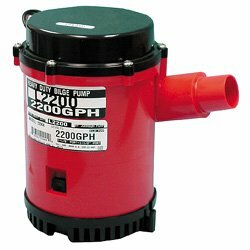 So a 1200 gph bilge pump, is in the real world only giving you 960 gph. A wave that swamps the cockpit can easily dump 500 litres (132 gals) of water in the boat in one hit. I realise that that does not mean that the water goes into the bilge -it should drain out of your cockpit drains. But, just imagine for arguments sake that the water all goes below. The Attwood Tsunami rated at 1200gph (4,542 lph) running at full capacity would take 6.6 minutes to pump this out. If you say that friction losses cause by the length of pipe reduce efficiency to 80% then the time to pump 500 litres would be more like 8 minutes. Of course if the water was from wave then at least you have the inter wave delay to pump water out – if the water was coming from a leak in the hull then there would be no respite to the water ingress and the pump may be fighting a losing battle, Nevertheless it would, in theory, buy you a few extra minutes to find the right sized bung! I think I would rather blow the budget of £50 and fit a higher capacity pump such as the Johnson 2200 gph pump. Russ September 20th, 2008| One comment so far - be the next!|Tags: Electronics.